A melding of cultures and tastes, where the ideas and flavors of the past meet a dynamic present to create something wonderful and new. East Meets West. Past Meets Present. g is a step outside of expectations for our brewers, a chance to test the techniques shared with them by some of Japan's leading sakémasters. Medium-dry on the palate, ultra-premium G Fifty features a silky texture with subtle notes suggestive of nectarine, grape and pear with a balanced finish. An rich, genshu style saké that is big and bold with fruit aromas supported on the palate with a velvety, dense body featuring melon, cherry and a pepper finish. The Pacific Rim is not only where continents collide, but also where Eastern and Western culture combine to create new cuisine, art, music and philosophy. It's along the Rim, in Oregon, that we craft g saké a brew that combines the diversity of cultures into dynamic new premium sake. 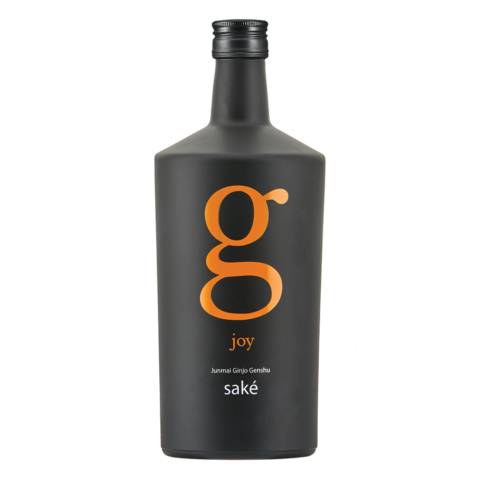 When g joy was first released we sent a bottle to one of America's leading saké experts, Eric Swanson in Las Vegas. He responded quickly and said; "This is the kind of saké I've wanted an American producer to make. It adheres to the traditions of fine saké, which appeals to the purist, yet it is crafted to have the big-layered flavors that the American palate has come to expect. This is a truly wonderful saké, one I have and will share with friends." There are no short cuts in brewing g. The rice used comes from one of the finest rice growing regions in the world, the Sacramento Valley. The climate, soil and water resources are ideal for growing rice and the trek north to Oregon is relatively short. Koji-kin and yeast strains used in g saké are both from Japan and combined provide the diversity of flavors layered in each bottle. And the water? Its from our home here in Oregon. Perfect for saké. Handcrafted using ancient Japanese techniques and American sensibilities, g is the essence of East Meets West & Past Meets Present. Saké is about 80% water. From a utility standpoint, as long as the water is clean it is generally suitable for brewing saké. However, in premium saké, water composition matters a great deal which is why seasoned saké drinkers can often connect flavor characteristics to unique regions. SakéOne’s founder chose Oregon because he believed that the best quality water for saké brewing is in the Northwest, specifically on the east slope of the coastal range in Forest Grove, Oregon. Through an exclusive partnership, SakéOne sources its saké-friendly Calrose grain from the Sacramento Valley. Calrose is derived from Japanese saké rice and has several qualities that produce saké with more body, higher viscosity, and a long, pleasant finish. This not only gives our styles a regional authenticity, but also aligns closely with our values to be an earth-friendly brewer. SakéOne owes its award-winning premium saké expressions to its talented and diverse brew team. Not unlike its fine brewing partners in Japan, SakéOne's craft brews are a reflection of the quality local ingredients it taps into and the people that define its community. Whether it's G Joy, Momokawa Silver or Moonstone Asian Pear, each sip offers a glimpse into Pacific Northwest food and social culture. I had never thought to drink saké with anything other than sushi until a friend brought a bottle of G Fifty to share over our favorite local pizza. It couldn't have been a more perfect pairing.